Rudy Funk said there wasn’t anywhere near enough quality from his AFC Mansfield team after they were well beaten by ten-man Stamford. 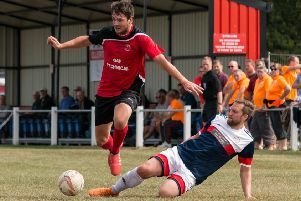 Two goals in the first half were enough to see Stamford earn all three points at the Zeeco Stadium, despite Daniels skipper Jake Duffy seeing red straight after the interval. “Today was probably one of the poorest performances we’ve had this season,” said Funk. “It’s very frustrating, it’s very tough at the moment and we have to get our act together very soon. Assistant manager Mark Ward reckoned that there was naivety amongst the AFC Mansfield squad. “In the last two games I think we’ve lost in the wrong manner, where we’ve not competed or caused any problems,” he said. “We looked a million miles away from the last two teams we’ve played, in terms of creativity, pace, strength and in quality. “When you’re rock bottom and you should score, but they go down the other end and sucker-punch you, it feels ten times worse. Ryan Seal opened the scoring when he was fed through by Joe Boachie before tucking past Tom Crosby. Jack Broadhead had perhaps the best chance of the game for the Bulls, heading a corner wide at the back post from only a few yards out. Only moments later, AFC were punished to the maximum as Crosby’s one-on-one save from Seal dropped the ball into the path of Isai Marselia who tapped the rebound home. Stamford captain Jake Duffy was sent off with just one second-half minute played after a stamp on Iaciofano, but the Bulls struggled to create any chances at all bar a one-on-one opportunity for Grant Ryan who saw his effort tipped wide.